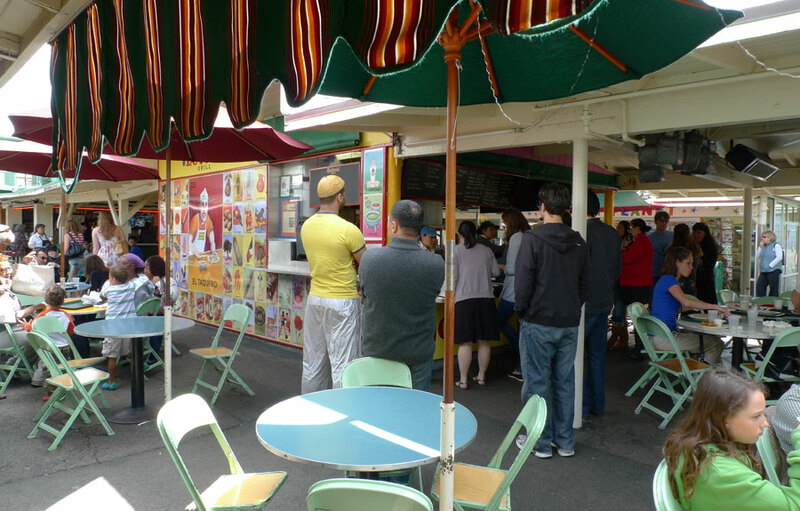 Although The Grove next door is more famous, the Original Farmers Market at 3rd and Fairfax is one of the true great pseudo-public places in Los Angeles, comprising dozens of great eateries within a dense mat of pleasing indoor, outdoor, and covered open spaces. The physical grain of its spaces is small and intimate, and the impression the Market gives is that of an organic, bottom-up conglomeration rather than a top-down, master-planned-by-a-genius-architect whole (which it probably was 75 years ago). Architects may not know how to create spaces like this, but neither would any client build such a place today. Loteria Grill is my favorite place to eat in the Farmers Market, and I went there every couple of weeks back when I worked in the neighborhood. Today was my first visit this year to the Market, where with lunch I enjoyed the company of Carmen and an old friend from UCLA Architecture, Olivia Ku. 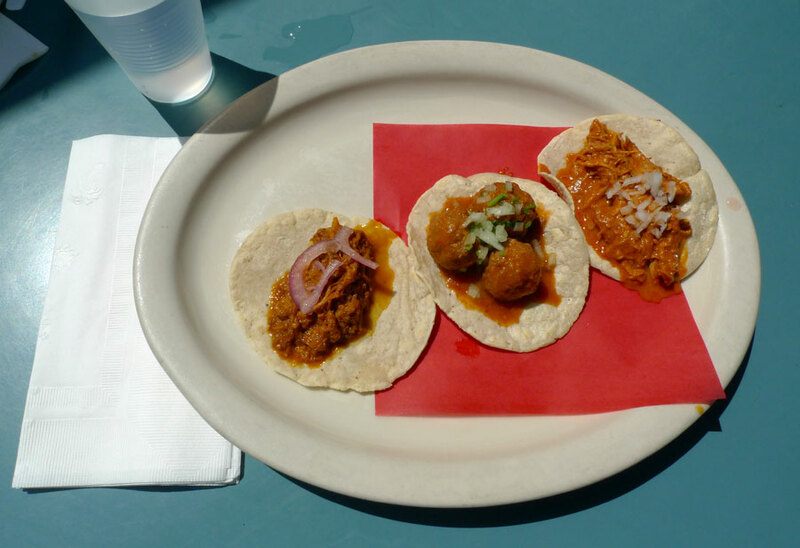 Loteria qualifies as a gourmet taco shop – instead of the usual suspects like carne asada and al pastor, a variety of rich regional Mexican stews are offered. I chose three tacos from a roster of 13: chicken in pipián rojo; albóndigas en chipotle; and cochinita pibil. When they arrived, I realized I had ordered three taco fillings all the same color, a saturated and ideal dark-orange/light-brown, and all three were leaking an oily orange sauce resembling that pepperoni juice that you should avoid the temptation to sponge from your slice of pizza. Expensive at $2.95 each, the tacos varied from rather small to average. The tortillas are handmade and very good, thick, irregular, bubbly, leathery, resilient. Moving from left to right, I started with the cochinita pibil, slow-roasted marinated pork. It’s juicy and super tasty, sweet with strong citrus and hot pepper flavors, and the citrus-pickled onions on top vinegary and providing a strong counterpoint. It went by all too fast. I moved on to the albóndigas en chipotle, three meatballs in a tomato-chipotle sauce. While I wouldn’t say that this is not Mexican food, it felt like I was eating some kind of Italian-food/taco fusion mash-up. The meebos were tasty and full of flavor, as was the sauce, with strong smoky chipotle flavor. I couldn’t help but think of Ikea meatballs, which I now realize could be successfully transformed at home into a magical burrito (with tomato sauce, Sriracha rooster chili-garlic paste, parmesan cheese, grilled onions, and let’s say, some gnocchi). Finally, I hit the pollo en pipián rojo, chicken in a pumpkin-peanut sauce. The dark-meat chicken is stewed and smoky, with a very strong and unmistakably chickeny flavor. The sauce is spicy and indeed tastes of both pumpkin and peanut – exotic. The taco is a super flavor mouthful. In that past life where I came often to the Farmers Market, my typical order was the pipián rojo burrito. I enjoyed my tacos, but a meal of three of them was not so filling. I will continue to advocate the burritos (to invoke the name of the taco’s natural rival) at Loteria Grill. They come with chips and are altogether a better value, if you have the single-mindedness and discipline to shun the variety made possible by tacos and eat only one thing. Unlike other posts, this one has no comments on the size and consistency of the tortillas, they look pretty thin and small. No bargain at $2.95 each. .
No bargain indeed! Carmen ate four tacos and was disappointed to be still hungry. The burrito is definitely the way to go.